This document for health service organizations outlines a comprehensive strategy for management of human resources for TB control, specifies the role of national TB programs, and the support by international organizations and agencies. Neglect of human resource development has been identified as one of the main constraints to rapid expansion of DOTS and for many years has been synonymous with organizing training courses. 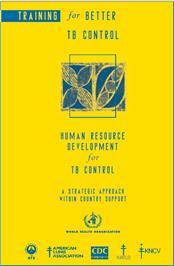 This document provides a strategic approach to training or better human resource development beyond the organization of training courses. Topics include: 1) defining the problem; 2) improving training activities for TB control; 3) defining the goal; and 4) strategies for reaching the goal: the strategy at country level; the strategy of international organizations.